The 15th day of the 7th lunar month is Taiwanese Halloween. According to tradition, Taiwanese offer food, drinks, and burn "paper money" to Hehynadi (good brothers/ghosts). Paper money is a piece of rough paper with a square patch of gold or silver colour in the centre. It is said that gold is for Gods, and silver ghosts. With today's purchasing power of Taiwanese, burning massive amount of paper money is certainly good for enviornment. 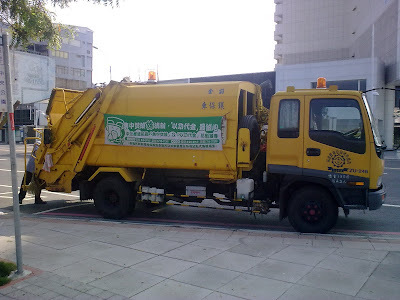 Hence Kaohsiung city government incourage citizens to replace the paper money with charity donations, or burn it at a centralized location. 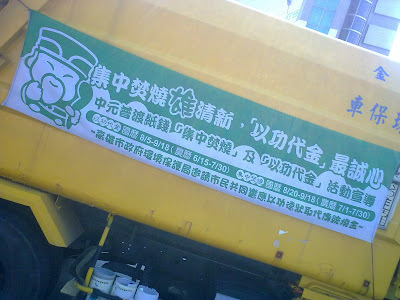 This anouncement is made by the banner on the side of dump trucks.